Our Tuesday Centre offers specialist ensemble opportunities for young musicians at around grade 4 standard to develop their musical interests within a range of styles. Members are given opportunities to collaborate with different groups and can belong to more than one group. This centre is often involved in project-based work, where guest artists are invited to collaborate with our Tuesday groups. In the past, this has included projects with the Grand Union Orchestra. 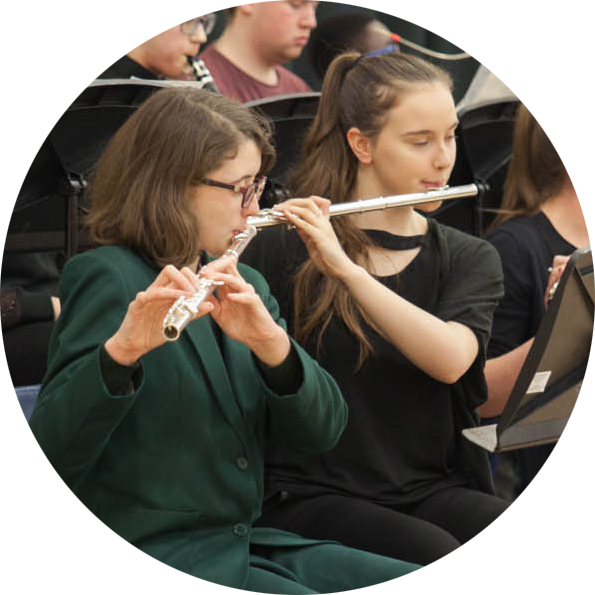 Fluteharmonic is a group of approximately 25 talented and enthusiastic musicians from various schools in and around the Croydon, Sutton and Bromley areas, ranging from grade 4 to Diploma standard. They enjoy performing at various events throughout the year. Past events have included Sir James Galways' birthday celebrations and The Olympic Torch Ceremony that was held in Croydon. The group covers an exciting range of music, from traditional Baroque or Classical music to current Pop music. The Guitar Ensemble aims to provide young guitarists with group playing skills in a friendly social environment. It is aimed at pupils of grade 2, ABRSM Gold medal and beyond. The group consists of classical and acoustic players working on material suitable for the overall standard of the group. There are easy parts and more challenging parts for more experienced players. It helps to have good reading skills but there are tab parts and chord parts as well. The repertoire is varied covering well know pop repertoire to jazz and classical pieces. The group often shares projects with singers and other instrumental players and ensembles. “Cos it’s Rap Club, this is what we do. The CMA Rap Club is a unique project that develops up-and-coming rappers, singers, song-writers and musicians. Previously performing at Wembley Arena, Disneyland Paris and unbeaten in multiple Battle of the Bands competitions, it is a very exciting musical community to be a part of with excellent energetic performances. Everything Rap Club perform is original, and members use this music to present the thoughts, struggles and opportunities that they encounter growing up in Croydon. CMA Rap Club is aimed at musicians and lyricists who are interested in developing their craft and taking up unique opportunities. For those who wish to progress their band playing skills beyond the initial RockWorks levels. Learn how to set up a PA, run a mixer desk and understand modern band band health and safety. Members also prepare and rehearse standard rock and pop repertoire to a more advanced level. Suitable for grade 3+ players. Croydon Youth Clarinet Choir has a regular membership of around 20 players, all of whom are of Grade 4 - 8 standard. Their repertoire is interesting and diverse, ranging from arrangements of the Classics (for example “Sorceror’s Apprentice and Tchiakovsky “Sleeping Beauty”), to fun arrangements of jazz and popular music ("Pirates of The Caribbean" and “Phantom of the Opera” have featured recently), to original compositions. CMA owns almost the full range of different clarinets, and you would have the opportunity to try any from the tiny E flat Clarinet to the huge Contra-bass if you wished! 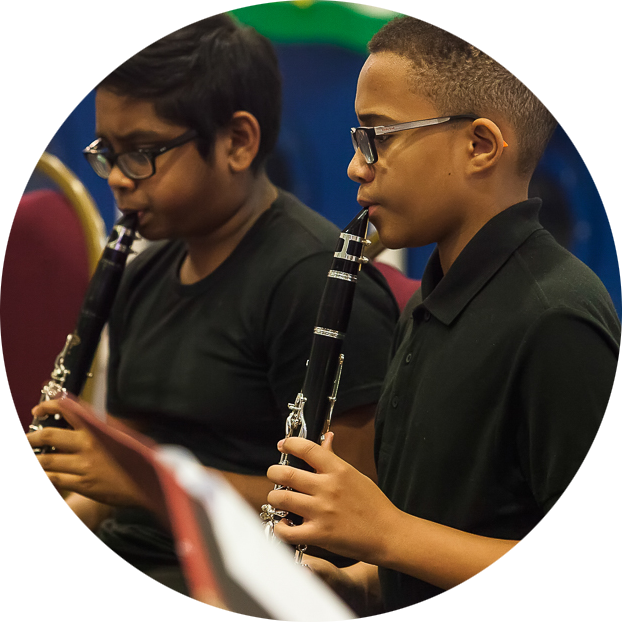 Croydon Youth Clarinet Choir performs regularly at CMA’s own Concerts and also at external events, including regular outings to the large-scale concert halls. The Brass Ensemble features players of grade 6 and above level on all brass instruments. Many styles of repertoire are covered including brass chamber music, Jazz and Funk, Baroque, Classical and Renaissance offerings by some of the finest composers for the medium. Recent pieces include works by Bourgeois, Handel, Barber and Susato, and the ensemble often splits into smaller groups when numbers allow in order to allow for different ensemble experiences. The group has performed at CMA concerts, as well as a recent performance at the Fairfield Halls before the Royal Philharmonic Orchestra. The Percussion Ensemble covers a wide range of tuned and un-tuned percussion and music including the most recent pop arrangements, musicals, classical and contemporary repertoire. Our age range is between 11-18 and grades 3-8. 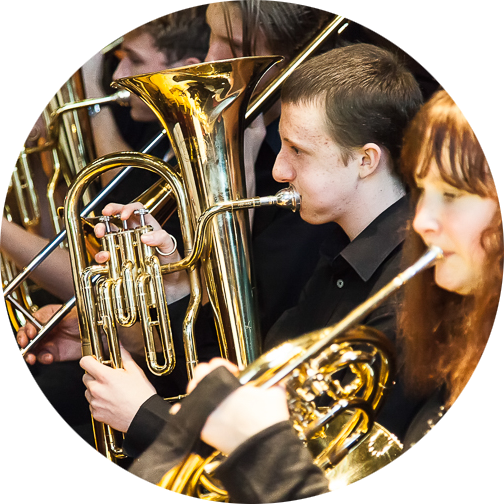 The Jazz Band is comprised of the best players from the brass, woodwind and percussion centres to make an advanced jazz collective. The group follows a standard big band formation, but has been known to include singers, strings and flutes when required. The group covers all types of Jazz, Funk, Soul and Motown music, from the standards (Duke Ellington, Count Basie, John Coltrane), to modern takes on more recent music by artists including Michael Jackson and Stevie Wonder, and has also covered music from lesser-known independent composers. The jazz band has performed at CMA concerts, as well as abroad in Germany, Croatia and Holland. They have performed independent functions and events, including the Croydon Council Awards, the reopening of Wandle Park, the South Norwood Community Festival and the CIC Awards at Crystal Palace FC.